One of the most important things you will ever do is teach your children the Lord’s Prayer. Often called “the Perfect Prayer,” the Lord’s Prayer is Jesus’ own instruction on how we should pray. It is packed with meaning and value and learning it can change a child’s life and give him or her the Biblical foundation they need to draw close to God and gain comfort amidst life’s challenges. However, the Lord’s Prayer also contains a lot of big words that can be hard for kids to say as well as fully understand what they mean. Easy, Fun & Meaningful for Your Students? How can you make sure they learn it, embrace it and make it something they hold on to for the rest of their lives? Hi, I’m Mary-Kate Warner and as a Sunday School director myself, I used to struggle with these exact questions. In fact, I often lost sleep worrying about whether my Sunday School students were really learning the Lord’s Prayer in my classes. You see, I knew how important this prayer had been in my own life. I knew the comfort its words had on me when I was surrounded by difficult circumstances. I knew how much closer I felt to God when I prayed its words. I wanted my kids to have these same experiences, so I tried numerous messages, games, songs and other techniques. Some worked, some didn’t … but slowly over time I was able to find methods that worked extremely well and now I’ve put all of these “best of the best” methods in one lesson pack so that you too can teach kids the Lord’s Prayer in the most effective, most efficient manner possible. Filled with attention-grabbing, meaningful lessons, exciting games, fun crafts, memorable songs, tasty snack suggestions and worksheets that really drive everything home, this lesson pack is what I use every year now to ensure my new Sunday School students learn the Lord’s Prayer and make it an important part of their lives. With this lesson pack, I don’t have to lose sleep worrying about whether my kids are really going to get it or not. I don’t have to struggle to get their attention in class. I don’t have to grasp for the right words to say so that they’ll develop a real appreciation of the Lord’s Prayer. With this lesson pack, I automatically have everything I need to create an impactful, life-changing Sunday School class. Active Part of Kids’ Lives! When I created this lesson pack, I wanted youth ministry leaders to have a wealth of approaches for teaching the Lord’s Prayer. That’s why I’ve included object lessons, games, crafts, songs, snacks, and even a science lesson. You can use one of the object lessons in conjunction with one of the games and crafts for a great themed Sunday, or you can use all the materials, spreading your message over several weeks! The two object lessons contained in this lesson pack can be taught in 10 to 15 minutes, and each contains a fresh, creative approach to looking at the Lord’s Prayer that is sure to capture your students’ attention and get them to understand the true importance of the Lord’s Prayer. In fact, if you can read and throw in some exciting inflections, it’ll be extremely easy to grab kids’ attention and keep them actively involved in these lessons and activities! My biggest goal in creating this pack was to enable teachers like you to present the very important message of the Lord’s Prayer while feeling that you have a wealth of excellent support material. I didn’t want you to lack for anything, and I’m confident you will find the ideas in this lesson pack original, thoughtful, economical and fun! 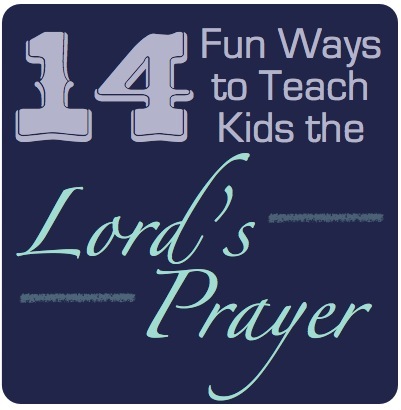 Now without spending days or dollars preparing, you can have everything you need to create Lord’s Prayer lessons that kids will cherish and remember well into the future. for One Special Low Price! So how much would you expect to pay for tools and resources that will allow you to grab kids’ attention and keep it while teaching them something that will change their lives for the better? Well, right now you can get The Lord’s Prayer Lesson Pack for just $19.99 – that’s a full $20 off the regular price of $39.99. But you must hurry, this special low price is a limited time offer that is only being made available to the first 250 people who order. After that limit is reached, I will raise the price to the full $39.99 – which I think is still a terrific bargain for all of this great classroom material. Remember, you could easily get a month’s worth of Sunday School classes (or maybe even more) from this lesson pack! To take advantage of the current special offer, click on the order now button below. Remember: the lessons and activities in this pack have been specifically designed to entertain and educate young students. If you want a classroom full of engaged, wide-eyed kids, I urge you to order now! That’s right, I am so sure that you will love The Lord’s Prayer Lesson Pack that I am offering an unconditional 100% money-back guarantee. If you are not completely satisfied with the lesson pack, all you have to do is notify me within 60 days of your date of purchase and I will refund your money, in full, with absolutely no questions asked! Either get the tools, resources and activities you need to teach your students the Lord’s Prayer or get your purchase price back! Plus, when you order The Lord’s Prayer Lesson Pack you can take advantage of the immediate download feature to get the full pack in just minutes from now … that means you could be using it to teach this Sunday – even if you place your order late on Saturday! In the gospel of Luke, we are taught that one of Jesus’ disciples approached him and asked him to teach them how to pray. The Lord’s Prayer was Jesus response and it is a powerful example for how us believers should approach God. In fact, the Lord’s Prayer is a perfect model for prayer that all Christians should know. Still, learning this prayer, with its big words, can be difficult for some children. In The Lord’s Prayer Lesson Pack, I’ve tried to make it easier to teach kids this incredibly valuable prayer through the use of interesting stories, exciting games, catchy songs and much more. You know, when you stop and think about it, it’s kind of amazing that we can pray the exact same prayer that our Lord Jesus Christ prayed. By teaching this prayer to kids, you’ll be teaching them something precious that will stay with them – and benefit them – for the rest of their lives. When you could save yourself a lot of stress and hard work as well as valuable time and money by getting The Lord’s Prayer Lesson Pack today? You’ll get everything you need to get your students to truly understand the importance of the Lord’s Prayer. The real importance of prayer in our daily lives! The value of praying the way Jesus showed us to pray! How to pray to God sincerely with our whole hearts! The difference between prayer and “much-speaking” and why it’s so important that kids know the difference going forward! How to memorize the Lord’s Prayer faster and easier than they dared hope possible! How to pray the Lord’s Prayer with meaning … every time! Armed with this lesson pack you’ll be able to get a classroom full of students to hang on your every word … to voluntarily participate in activities and games … to eagerly learn more about the Lord’s Prayer. But remember, the current special low pricing is only available to the first 250 people who order. Don’t miss out! Click on the order now button below to get your copy of The Lord’s Prayer Lesson Pack at this special low price now before it is too late! P.S. The Lord’s Prayer is a living record of what Jesus wants us to think about when we are praying to him and so the sooner everyone learns the Lord’s Prayer the better. Ensure your kids learn the Lord’s Prayer as fast and as easily as possible by getting this lesson pack today! Order now. P.P.S. Remember the current low price offer of $19.99 won’t last long. Get your copy now before the order limit is reached and I’m forced to raise the price. Order now. P.P.P.S Also remember, that yo u are making this purchase at absolutely no risk. So grab this special low price while you can! If The Lord’s Prayer Lesson Pack isn’t everything you were expecting, you can request a full refund. Still questioning whether this lesson pack is right for you? Email me to discuss further how it can benefit your students and make your job much easier.